Alcea rosea is an old fashioned plant that I remember from my childhood but I don't see in many gardens now. When I was a kid there was an eccentric woman in my neighborhood that we called the "crazy bird lady" because her old Victorian knock-off was always covered in pigeons. I have a lot of memories of going down to the neighborhood store to buy milk and having to duck the bees that congregated around her Hollyhocks. Last year I traded seeds that I was told would bloom black, I was pleasantly surprised when my Black Hollyhocks started blooming. There are two types, a single and a double flower, growing in the garden right now that are absolutely covered with ants and an unknown beetle like bug I have to get IDed. According to Diana Wells (author of 100 Flowers and How They Got Their Names ) Hollyhocks were brought back to Britain by the Crusaders. 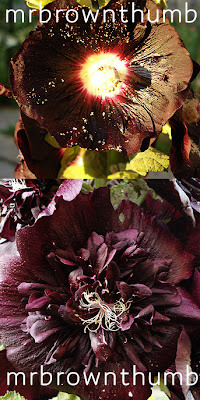 She also states that remains of Hollyhocks were found in a grave of a Neanderthal man. Which isn't really surprising since the scientific name translates to "to cure" and they have a long history of being medicinal plants. This particular Hollyhock is a biennial (will bloom the second year) but you can find some that are annuals that will bloom in many different colors. They can be grown in zones 4-10 and reach 4-8 feet in height. 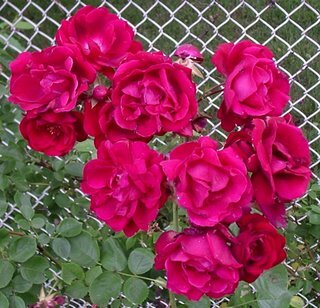 They make great plants if you're looking to grow something to provide privacy or mask a fence or wall. The downside is that they are susceptible to spider mites and are prone to rust which can nowadays be treated with chemicals or you can remove the leaves that become infected. I wish more people grew them in Chicago because they are beautiful bloomers. Here's to you "Crazy Bird Lady," I know these aren't the pink or reds you grew in your garden but I hope you like them. I LOVE LOVE LOVE hollyhocks! The single ones. I had to stop growing them because they got rust so badly. Removing the infected leaves didn't work. Now I grow Malva sylvestris 'zebrina'. They are not nearly as large but they also don't get rust. I'm in Chicago and grow lots of hollyhocks every year. Love them and have never seen them in any yard around here. I wintersow them and get beautiful blooms the first year. They reseed along the back fence so now I have a nice mix that comes back every year. The lower leaves usually get rust later in the season but I've just learned to plant things in front of them to hide it. They are really an easy to grow plant here in Chicago. Someone mentioned the Malvas on a blog recently and I'm going to look into it because they are pretty flowers and would make for some cool photographs. And I'm keeping my fingers crossed with these and hope I don't come across rust. Glad to hear that you're in the area and growing them. You know when I was a kid there were so many of them around and I particularly remember them growing along back fences in alleys here. But a lot of those gardeners have gone so you don't see as many. Hope you take pics of yours. Oooh, the double one on the bottom is really pretty. Wish I hadn't forgotten to save seeds from them.